Striking blue and teal 1984 Carrera inspired the establishment of Porsche Exclusive. The sky's the proverbial limit these days when it comes to personalizing Porsches straight from the factory. But that wasn't always the case. Like when Tilman Brodbeck ordered this 911 as his company car. Brodbeck had already been working at Porsche for 14 years, first as a body tester, then as an aerodynamicist, when he put in this special order in 1984. By that time he was executive assistant to the CEO (one of five he would serve), but clearly displayed a keen sense of aesthetic style. He chose a 911 Carrera 3.2, but wasn't satisfied with the standard options. To replace his custom white-pearl Turbo 3.3, he took his new Carrera right off the assembly line, after the primer was applied, to a nearby specialist paint shop and had it painted a deep midnight blue with turquoise highlights applied freehand (including the Fuchs alloys). He then had velvet carpets and leather upholstery installed in the same shade of teal, with Ricaro seats featuring inflatable side bolsters. His boss was apparently so impressed that he tasked Brodbeck with establishing and heading the Porsche Exclusive division that would similarly customize the factory's cars for its most discerning clients. 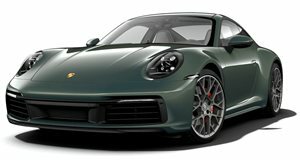 Brodbeck kept his company car for longer than usual, but when he eventually moved on to something else, the custom 911 was sent to a new owner in Sweden. 31 years later, a collector came across it and sent it back to Porsche Classic for an overhaul, where it was found to be in excellent condition. Once complete, Porsche reunited it with its creator.